Pierce each yam all over with fork. Add 3/4 cup marshmallow creme, butter, and syrup; mash until smooth. Cut thin slice from top and bottom of each orange to make flat surfaces. Cut oranges in half. Scoop out pulp; reserve for another use. 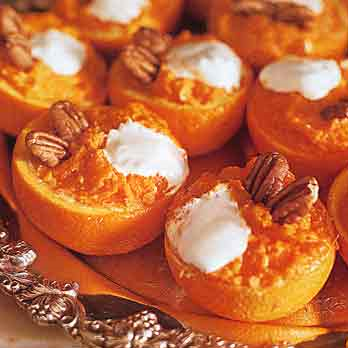 Place orange cups on 2 baking sheets. Divide yam mixture equally among cups. Top each with dollop of marshmallow creme and 2 pecan halves. Bake until beginning to brown, about 30 minutes.